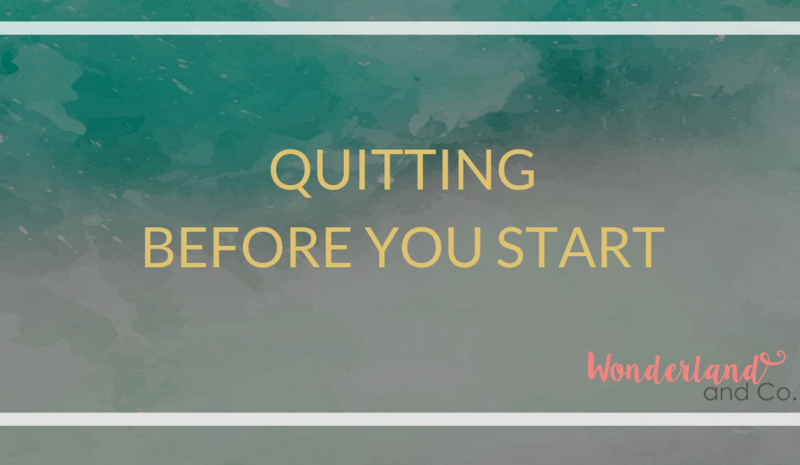 Quitting before you start - Wonderland & Co. Sometimes, quitting before you start can be a good idea. 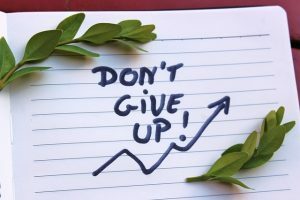 When it comes to smoking, drugs and a myriad of things I personally think are a bad idea (such as skydiving, regrettable haircuts and polar bear swims, but these are subjective), it’s easy to see the outcome is not what you want in your life. But what about the things you do want? From careers, dreams, relationships and whatever you hold as dear, what have you given up on before the starter pistol fired? I have wanted to be a lot of things in my life: an astronaut, until I got freaked out by the thought of having no oxygen (and all the math it would take to get there); a detective like Nancy Drew (armed with nothing but a bobby pin to save the day); a dancer; an actor; a writer; and now, a coach. Some of these dreams have remained, while others have faded. That’s okay: I remember the day I decided I no longer wanted to be a professional dancer. The realization was crystal clear. I loved to dance, but I didn’t want to be a dancer. I remember being afraid to tell my mom: What would she say, after all that sacrifice and training? She said she was relieved. She was proud of me for giving it all I had and trying so hard, and for being willing to let go when it wasn’t something I wanted anymore. Other dreams remained fast: Wanting to be a writer and then realizing it’s not something I want to do, but somebody I am being. I am a writer. Always have been. 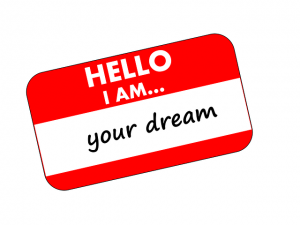 New dreams came along, too: Becoming a coach because I believe in a world where we can create the life we want to live. But one of my dreams—being an actor—got stopped before it ever got started. The night I realized that while I loved to dance, I didn’t want to be a dancer, I also realized that it was the acting that I loved (story ballets had always been my favourite). Being an actor, I thought, I could be literally anything. And so, I dreamed of a career as a successful actor (not mediocre, or even just a working actor, but a successful one). Here’s the thing, though: I never actually tried to make it happen. I quit before I got started. I met with one talent agent and that was it. I had a few auditions and did a tiny bit of extra work. End of story. It’s not like I’m not willing to do hard work; after all, I was accustomed to upwards of 15 ballet classes a week and getting straight A’s. Working hard is kind of an art form for me, one that I’ve perfected (said the perfectionist). So what then? What got in the way? Fear. I was so attached to the outcome of being a successful actor that I was paralyzed with insecurity and fear: I couldn’t move forward. “What if,” my innermost Wormtongue would whisper to me, day after day, “what if you try and then don’t make it? You’ll be a failure, unhappy forever.” Better to not try than to feel the pain of failure and the sting of loss. I had lots of reasonable reasons to not try: I needed a job, obviously. I’d grown up in a world where income and employment were scarce, so it behooved me to get ahead. I had student loans I had to pay back and blah, blah, blah. 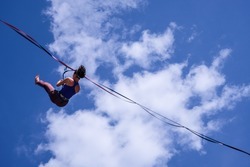 And so, I sat on my hands, hoped for a miracle and did nothing to move towards my goal. To be totally honest, I was hoping that my story would be one of those “I-was-scouted-in-a-shopping-mall-food-court” kind of stories. In retrospect, it was a very at-effect perspective. By waiting and hoping that someone else would make my dream happen, I got off scot-free (well, apart from all the unhappiness, regret and sorrow). In fact, I was the poor victim. It wasn’t my fault I hadn’t been discovered; it was the world’s. Here’s the thing about hope though: Without action, it becomes toxic (a really, really smart guy I know and respect immensely told me this). I struggled with this idea for a little while, but pretty quickly, it makes a lot of sense. Waiting for miracles to show up the way you want them to means you’re going to miss all the other opportunities because you’re looking the other way. It poisons your possibility. Hope itself is great. Thank God for hope. But hope and dreams don’t work unless you do. The good news is that I never failed at acting. Of course, I also never succeeded, either. By avoiding the potential for failure, I very effectively evaded any possibility for success, too, because you cannot have the latter without the risk of the former. That’s the way it goes. It’s kind of like holding onto a lottery ticket and not scratching it/checking it, because until you do, winning is still a distinct possibility (yes, I have done this on the rare occasions I’ve actually bought one). It’s going to get awfully heavy holding onto all those things you won’t put down. And, with your hands full of the stuff you’re holding onto, but not really going after, there’s no room for anything new and wonderful to take its place. Today, I’m glad I experienced all of this, though for a long time, I suffered from my woulda-shouldas. I lived in what might have been and regret. One day, though, I let that go: It got too heavy and I didn’t even want it anymore. I’m actually grateful that I am not an actor; the years have taught me that there are a lot of parts of that career that aren’t in line with my values and the things/people/creatures I hold dear. Today, I’m living my dreams, not waiting for them. They’re dressed in overalls and look like work, but they’re real and they’re really happening. I wouldn’t have it any other way. Have you ever quit something before you got started? I bet you have. Are you still holding onto it, or have you let it go?